My solar observing season tends to run from about February to the end of October. As I’ve noted before the Sun is too low to clear the roofs of the surrounding houses. For the last few seasons I’ve been sketching the view of the solar disc through my Coronado PST (Personal Solar Telescope) and occasionally augmenting that with white light details of Active Regions (ARs). I thought it might be interesting to compare the views from this time of year. I only started seriously recording at the end of the 2016 season, so the record isn’t a long one, but at least both the images below were made using the same equipment and are limited to Hα views. At the first glance, and doubtless due to my artistic talents, you’ll find that the Sun appears to be about the same: not especially active. A closer look and a scan of the notes reveals that there’s quite a difference. 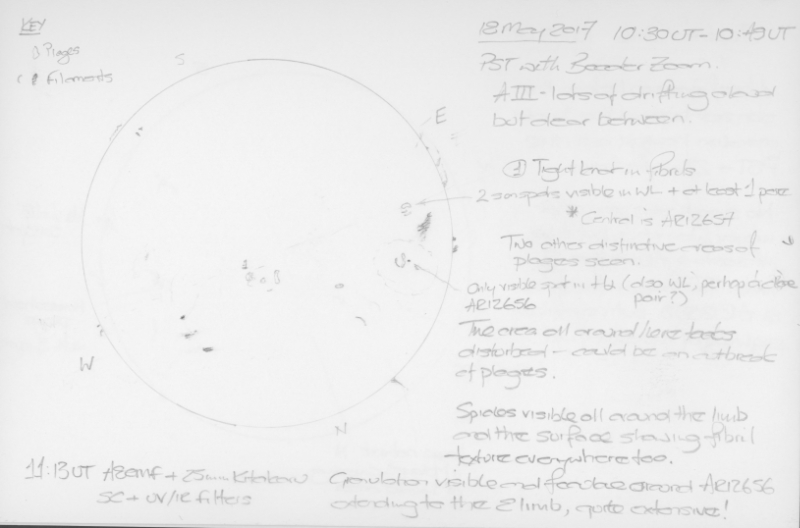 Hα solar disc sketched on 18 May 2017 with a PST and Baader Zoom. So to get the ball rolling I present my sketch and notes from mid-morning on the 18 May 2017. This view is sporting three substantial ARs with a sunspot visible in the PST. For sunspots to appear in Hα normally means that they’re large and plain to see in white light, something I’ve noted. I also note being able to see even more sunspots that way. There are also some good prominences and their cousins from the solar disc, the filaments. I’ve also added notes about the central AR12657 showing a tight knot in the fibrils that cover the surface of the Sun. 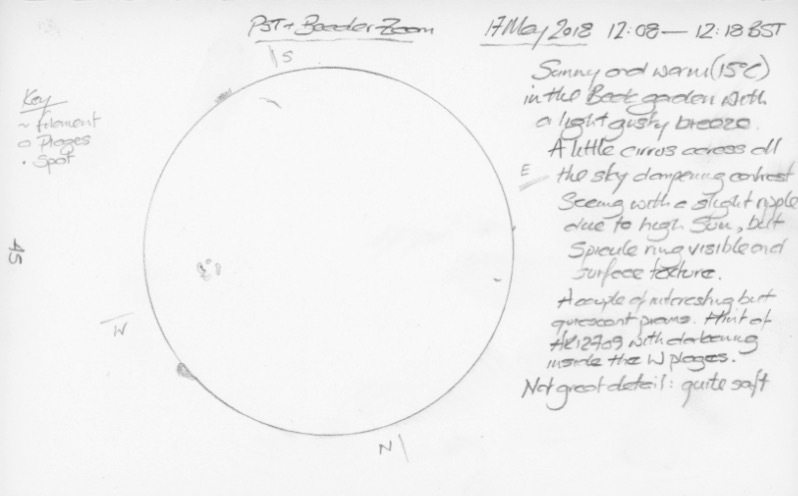 Hα solar disc sketched on 17 May 2018 with a PST and Baader Zoom. Moving on to my sketch from around midday on 17 May 2018 it’s a very different story. I’ll admit that mid-morning is a much better time to observe the Sun than midday as the intense heat from the midday Sun stirs up turbulence in the atmosphere, but still, that is a quiet Sun! Only AR12709 is visible with a pair of quiescent prominences – reasonably large though – and a few small filaments. There are no notes about the white light view because there was nothing much to see. The next couple of years might provide more of this as we pass through a Solar Minimum. That’s not to say that we can’t get some excitement, it’s just not as likely nor frequent. I’m hoping that the pessimists predicting a Solar Grand Minimum like the Maunder Minimum have got it wrong. All that said, there’s the nice detailed AR12712 on the face of the Sun as I’m writing this (a little delayed by software issues) according to SolarMonitor.org. It’s got multiple spots and is now classed as type βγ which could produce some small scale fireworks. Unfortunately for me it’s firmly on the wrong side of some persistent clouds and thunderstorms here in the UK. If you can see the Sun enjoy the view but always with the appropriate equipment. Would you believe it the Sun came out this lunch time! I’ve had a good look in both Hα and white light and even got the time to make a sketch before the cloud returned. There’s a lot to see in AR12712, I wish the seeing has been a little steadier, but you can’t have everything.